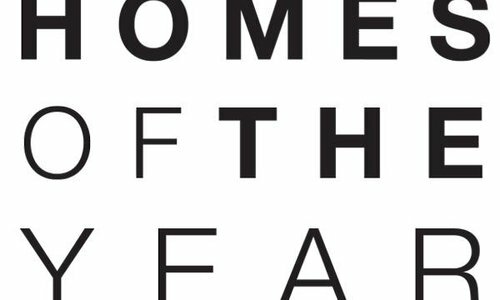 Year after year, we ask 417-land builders to show us their best work for our annual Homes of the Year contest, and every year, we continue to be impressed. This year’s contest started earlier this summer, when southwest Missouri’s very best builders submitted nearly a dozen jaw-dropping homes for thecontest. 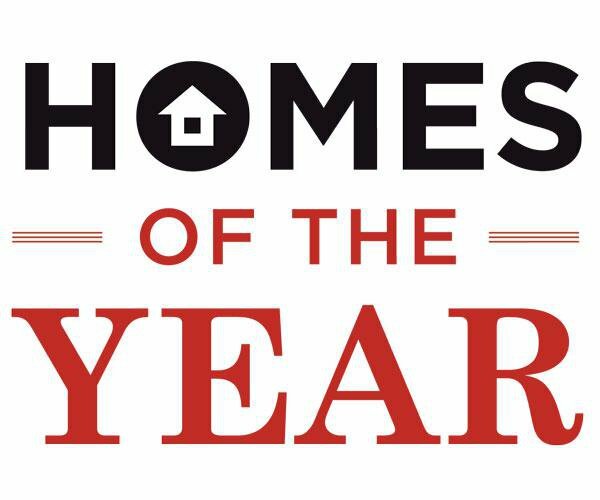 Next a panel of judges narrowed it down to the most fabulous homes in three price categories. We visited each one to capture the beauty and to learn the builder’s story. Each house is a work of art, dreamed up on paper, then made a reality by one of the top builders in our corner of the state. Take a look at these hand-crafted masterpieces, then start planning your own dream home. A GRAND WELCOME: Designer Jacque Pitts worked closely with builder Doug Pitts and the homeowners to achieve an Old World style without making the house feel outdated. Jacque added the cultured stone to the entryway walls and ceiling to give the space a grandiose look. Builder Doug Pitts’s latest custom build combines Old World aesthetics and charm with all of today’s comforts and conveniences. Our goal at DPC is to build homes that reflect the lifestyle of our clients. Fun projects, neat ideas and things outside the box. 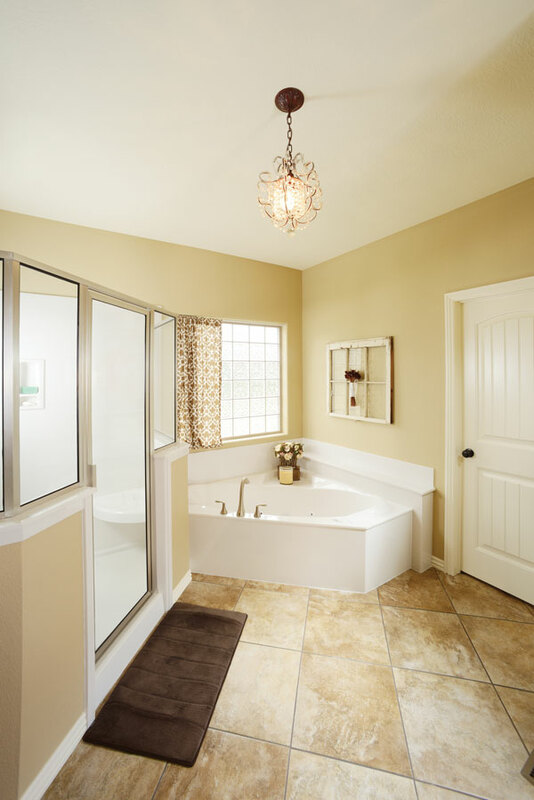 We pride ourselves on building homes reflective of the homeowners and their individual lifestyles. As many new homes take on a more modern style, Doug Pitts, owner of Doug Pitts Construction, just finished a home where new and modern are far from present. Pitts worked with Designer Jacque Pitts and Project Coordinator Kaye Lee to complete the home, which has many custom touches. This house features reclaimed wooden beams, brick backsplashes and stone ceilings. Stained wooden cabinetry and custom wooden tables deck the main rooms, where faux cobblestone tile blends with wooden inlays. Seated on 10 acres and surrounded by towering trees, this home whisks you back to Old World England. But it’s not the time travel that’s so impressive about this house, it’s Doug and his team’s ability to pull off Old World style and charm while still building a home that’s both energy-efficient and features all of today’s modern comforts. A TOUCH OF CLASS: The living room features a massive gas fireplace with concrete corbels. Designer Jacque Pitts brought in furniture from Brashears and worked with the homeowners to mix in their current furnishings. Huzzah! 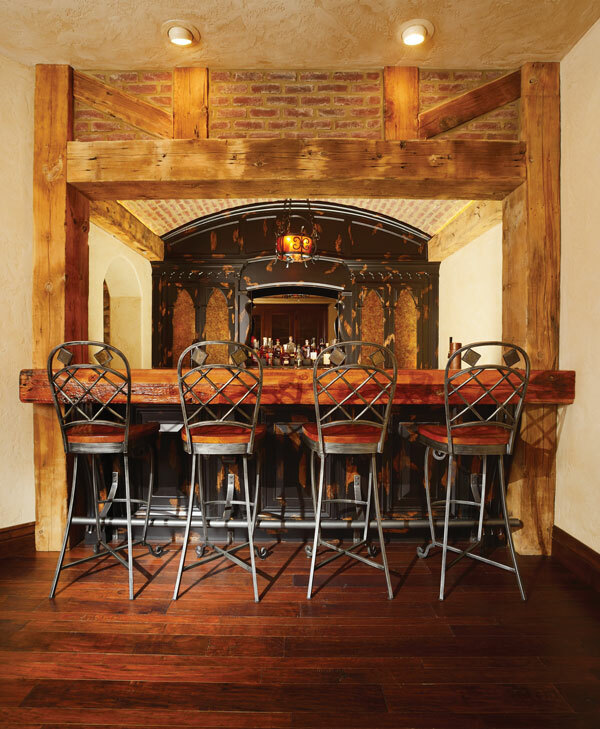 : To give the husband a place where he could relax with his friends, Builder Doug Pitts, Designer Jacque Pitts and Project Coordinator Kaye Lee worked together to build a basement pub that resembles an Old World English bar. They even included a custom copper bar tap. 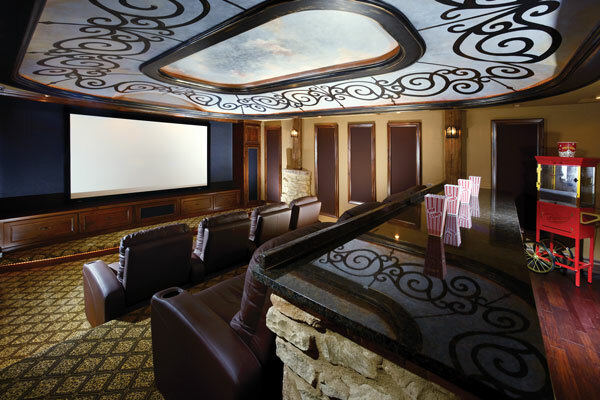 LIGHTS, CAMERA, ACTION:With enough seating for eight, an old-fashioned popcorn maker and a stunning vaulted ceiling, Doug Pitts and his team were able to turn the homeowners’ basement into a full-blown movie theater and entertainment center. Outside the theater, Pitts, Designer Jacque Pitts and Kaye Lee brought in comfy furnishings to create another cozy getaway where the family can lounge and look out over their wooded backyard. Just like in the rest of the house, Doug Pitts and Designer Jacque Pitts worked to make the master bedroom as functional and comfortable as possible. They included a reading nook, coffee bar, gas fireplace (left) and access to a private patio. Custom wood cabinetry is a beautiful highlight of the master bathroom, which also features glazed porcelain tile that is made to look and feel like real stone. 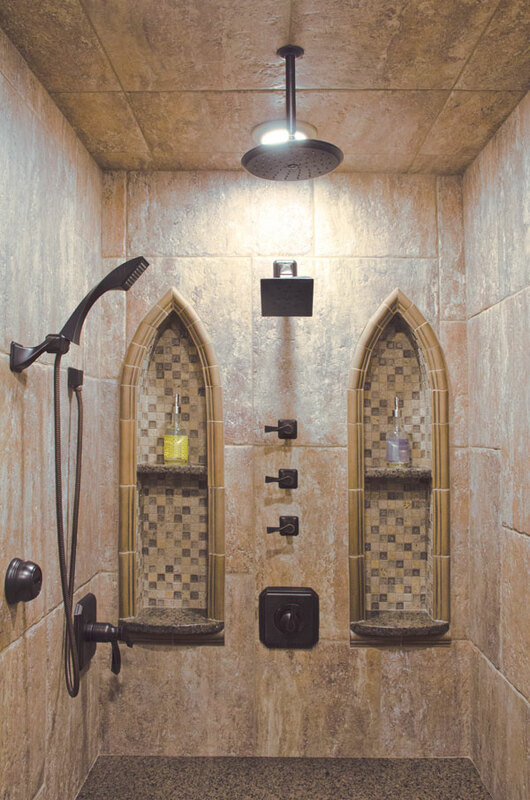 The space also features a massive walk-in shower with detailed tile work and custom shelving. 417 Home: How long did it take you to complete this project? Doug Pitts: About 17 months. 417: You included a theater room in this project. As a builder, are you seeing more families incorporate home entertainment spaces? D.P. : In the last few years, home theaters have become much more popular. There’s been more focus on incorporating home entertainment into custom builds, whether it’s an outdoor kitchen, theater or even just a bar. People really are spending more time in their homes. 417: How many types of wood are incorporated into the bar? D.P. : There are two types of wood, but four textures. This pub area is all about the husband. The pub and the wine cellar were the two big things on his wish list. I think we were really able to recreate the look and atmosphere of an Old-World English pub for him. 417: When building the wine cellar, did the homeowners have any specific wishes? D.P. 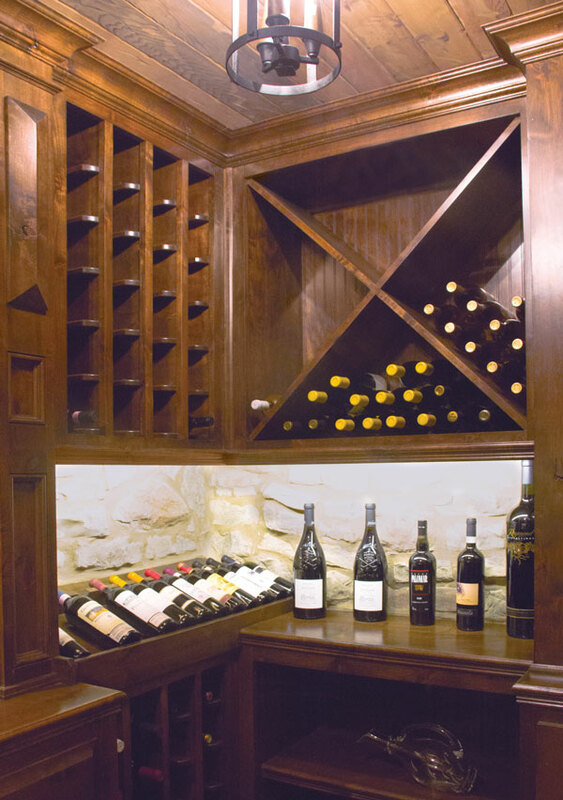 : Most houses that have a basement have the potential to include a wine cellar or storm shelter, so this was the perfect spot for the family’s wine collection. We knew this room needed to be temperature- and humidity-controlled, but we also wanted to give it that vintage look. The iron work on the door really adds to the look of this space. 417: Was the wall along the basement wine tasting area something the homeowners wanted? D.P. : The wall is made of Western red cedar, and the wine boxes incorporated are from Brown Derby (see behind seating area in photo, right). We distressed the boards on-site to give them that Old World feel and then laid them out to fit around the wine box cutouts. The owners knew they wanted to make a space where they could entertain and enjoy wine, but the wall was a surprise. I knew they loved wine, and they’re good friends with the owner of Brown Derby, so I made a call. 417: What did you do to keep this house up-to-date while sticking to the homeowners’ wish for a more Old World look? D.P. : The look of the house is definitely Old World, but we wanted the home to be as efficient and functional as possible. We included a state-of-the-art heating and cooling system with the Mitsubishi Geo Thermal units, so each room can be set to its own temperature. We used low-voltage lighting and included a great sound system throughout the house. 417: Is there anything else you’d like to add about this home? D.P. : The homeowners were great to work with. They came prepared with several creative thoughts, pictures and notes. Because they trusted us with their ideas, the talented subcontractors of Doug Pitts Construction were able to achieve the homeowners’ design ideas. Dale Peer, Dale Peer Home Design, Inc. Built for family and made energy efficient, Sam Clifton’s latest home is perfect all around. 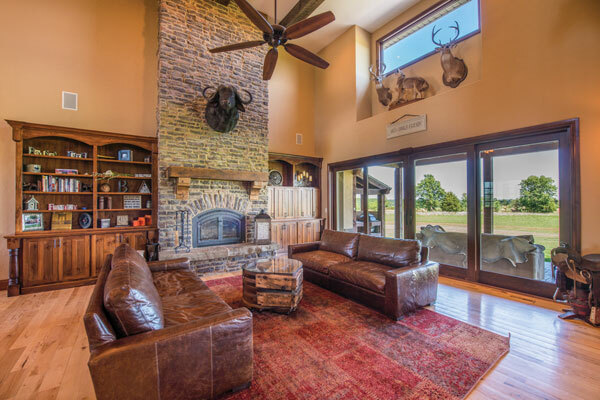 Built by Sam Clifton of Millstone Custom Homes, this home features a dramatic stone fireplace in the great room. The fireplace is also one of the home’s green elements, as special blowers help capture a lot of heat for the house. With dogs and kids in the mix, building a home that was functional and comfortable was incredibly important to the family who enlisted Sam Clifton, owner of Millstone Custom Homes, to construct their new house. “The idea was to make a country setting,” Clifton says. “They wanted a place where they could entertain family and friends while still feeling at ease.” The result is a relaxed five-bedroom home laid out for optimal entertaining and quality family time. 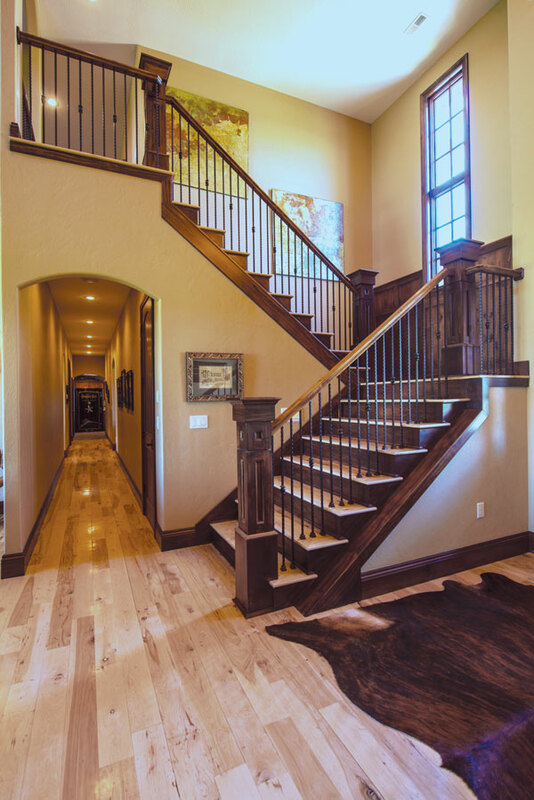 Builder Sam Clifton built this staircase as one of the home’s focal points. To let in more natural light, Clifton took advantage of the staircase’s height and put in extra windows. The great room’s two-story ceiling, rustic wooden beams and panoramic glass door help give the space the rustic atmosphere the homeowners wanted. “When we designed the house the goal was to bring the outside in,” says builder Sam Clifton. By skipping a formal dining room, Builder Sam Clifton was able to make the kitchen bigger. And with plenty of seating, the space has become an entertainment hub for family time and friendly gatherings. To help add to the home’s functional-yet-aesthetically pleasing details, Builder Sam Clifton added custom shelving and cubbies in the mudroom. 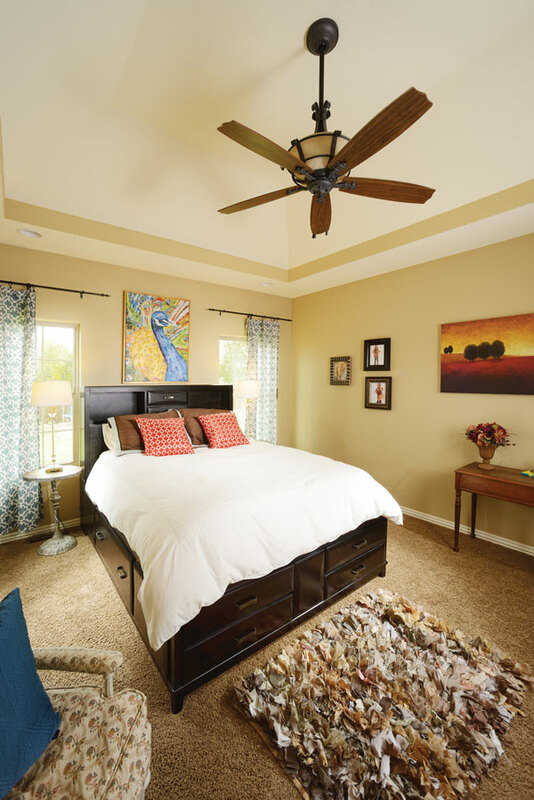 To give the master bedroom a cozy atmosphere, Sam Clifton and his team kept the color scheme simple and added plenty of soft lighting. The vaulted ceiling helps heighten the room and adds a focal point. Builder Sam Clifton incorporated plenty of natural elements throughout the house. 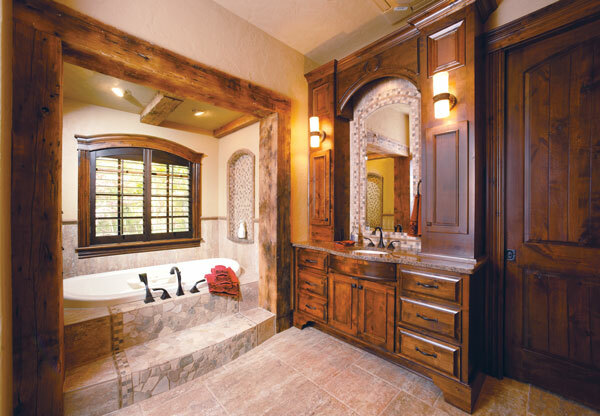 In the master bath, he brought in stone tile flooring and used the stone under the vanity mirrors. 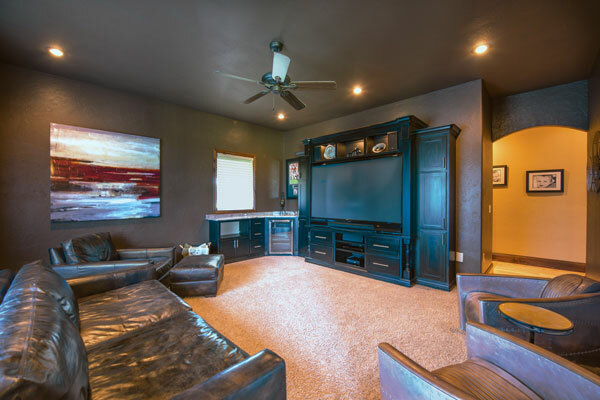 To give the family a place where they could relax and unwind, Builder Clifton included a home entertainment room in this custom-built home. 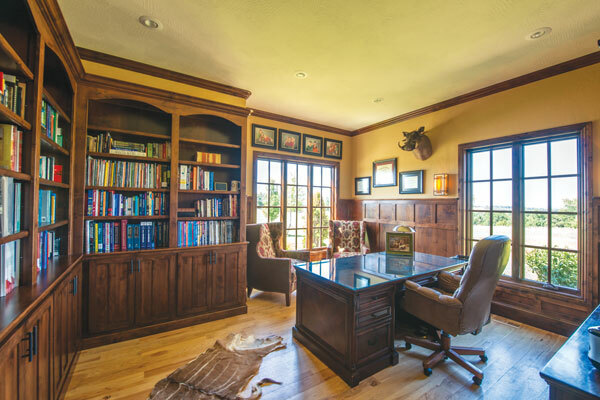 Adding a wow factor to the office, Sam Clifton used wainscoting, built-in book shelves and lots of windows. 417 Home: Describe the custom entry door. What does it add to the space? Sam Clifton: The door is made of knotty alder, and it is rustic in style, which goes along with the owners’ vision for the home. 417: What mood do the hand-textured walls set in the space? S.C.: The hand-textured walls were created by one of our talented craftsmen. 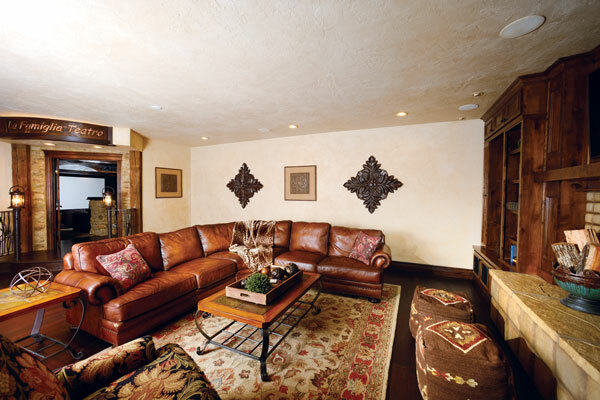 The mood set by the texture helps give the home an aged and rustic feel and adds to the overall feeling of comfort and livability that the client was wanting in their home. 417: How would you describe the home’s style? S.C.: The home is French country in styling. But what really brings the home to life is the homeowners’ styling. They incorporated objects that are important to them that show a glimpse of their life. This helped connect structure and style seamlessly and made this house truly a home. 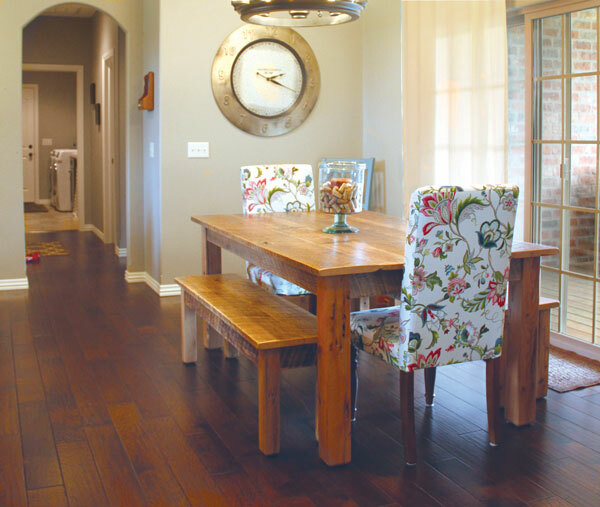 417: This home has lighter wood flooring throughout, yet dark custom cabinetry. Talk about the contrast and why it works in this space. S.C.: When it comes to styling, contrasts are often good. Contrast adds depth to a space and allows for a more eclectic form of design and use of objects in a home. 417: The mudroom is clean and organized. What popular mudroom trends did you incorporate? 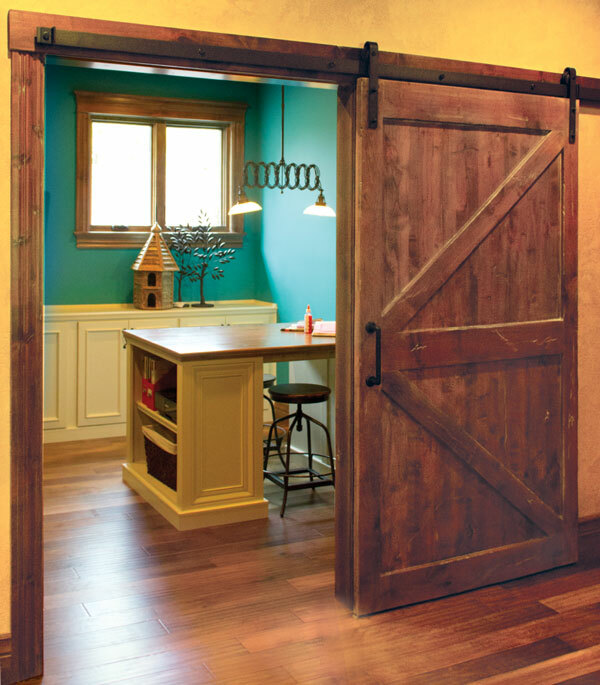 S.C.: There are plenty of trends when it comes to this room and mudrooms in general. They can be as simple as adding a bench and some coat hooks or as elaborate as this one, which provides space for each member of the family to stage what they need for the day. 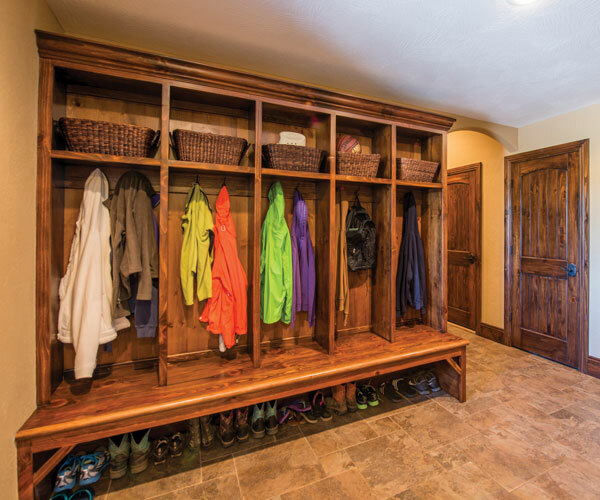 Many people are even going as far as adding seasonal and sport storage spaces to their mudrooms. Organization is key, helping not to needlessly clutter the home with coats, bags and shoes. Some people use this room as a docking space for their electronics as well, plugging them in and unplugging from the world as they walk into their home. 417: How long did it take you to complete this building project? 417: The entry is elaborate. How do you create such an entry, yet still make the home feel warm and welcoming when people walk in? S.C.: The entry is grand and massive, but it is in scale with the home. Scale and room size is very important in any home and needs to be carefully looked at in the design stage. 417: Many of the windows lack window treatments. What are some features that allow windows to stand alone without treatments? S.C.: The windows are low E, which helps in keeping harmful UV lighting out. Many people are opting for the use of fewer window treatments in favor of bringing in natural lighting. They are also showing off the home’s windows, casework and views. Many homeowners are choosing to only have window treatments in areas that require the most privacy. S.C.: This home was truly a pleasure to build. I enjoyed completing the vision of the owners and making this house a home. This was truly a team endeavor between the homeowners, myself and the many craftspeople that worked on this home. Blending French country features, rustic beam work and a bit of traditional charm, Dusty Essick built the Darnells’ dream home. 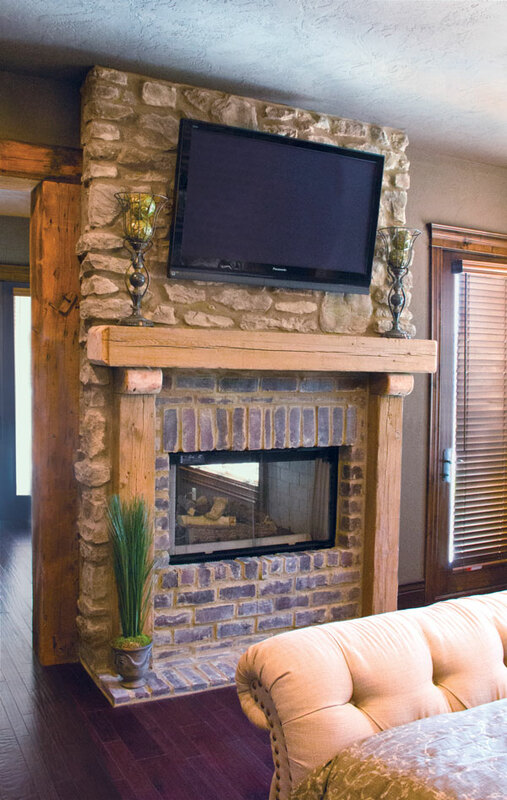 A stone fireplace is the main attraction in the living room of this home, which was built by Dusty Essick of Essick Builders, LLC. Built in less than five months, the comfort-meets-luxe home boasts a variety of top-notch features, among them hand-scraped hardwood floors, reclaimed timbers and granite countertops. Knotty alder cabinetry makes a statement in the kitchen and master bath, and arched doorways throughout help make the oversized space a bit more intimate. 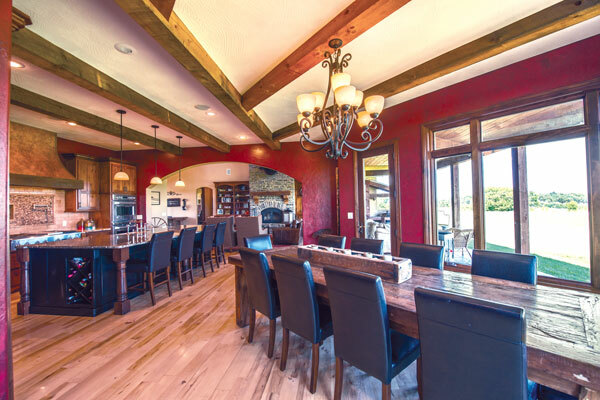 Rustic beams outline the dining room, which features a small table and a single chair. Rather than a chandelier, the couple chose canned lighting for this room and several other spots in the house. 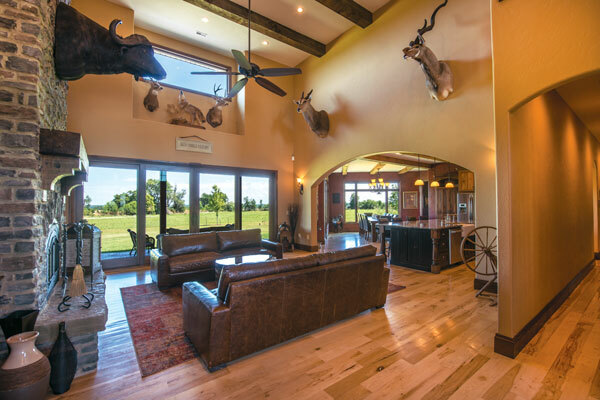 The home’s open floorplan connects the living room to the kitchen and dining room, and rustic beams on the fireplace and under the television help tie it all together. While Builder Dusty Essick built the home, homeowner Brooke Darnell did the interior decorating. 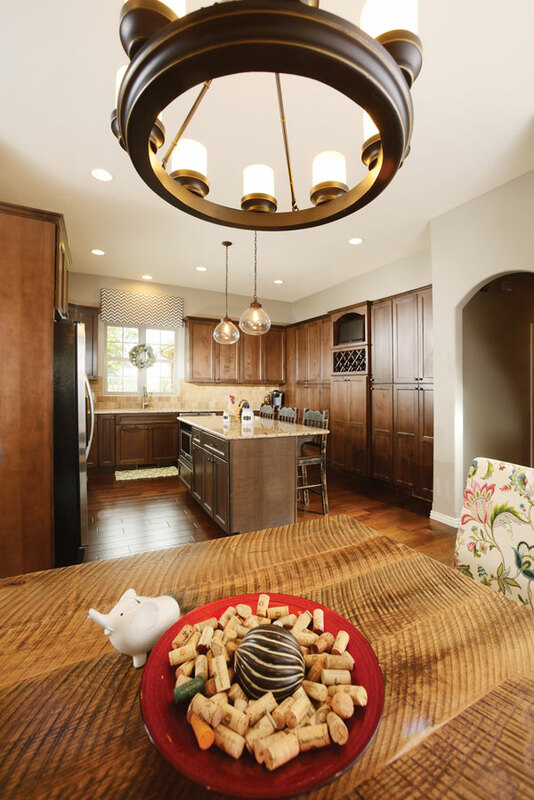 A large wall of knotty alder cabinetry provides ample storage space in the kitchen. 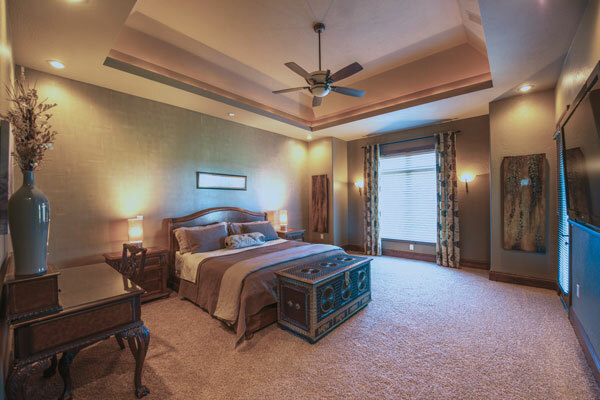 While most of the home has 10-foot ceilings, the master bedroom (above) features a 12-foot coffered ceiling. The space is dressed with décor that adds both color and comfort. 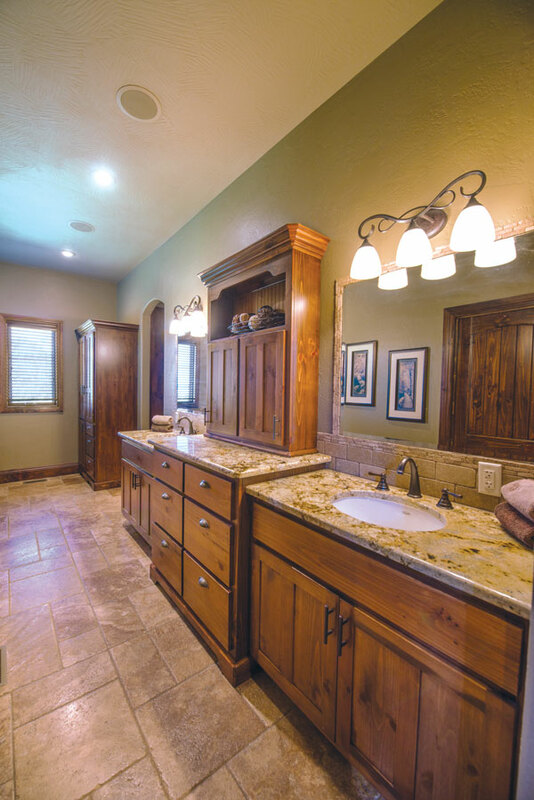 The attached master bathroom features a jetted tub, walk in shower and custom cabinetry. The tub and countertops are both finished with cultured marble, which provides a clean finish. 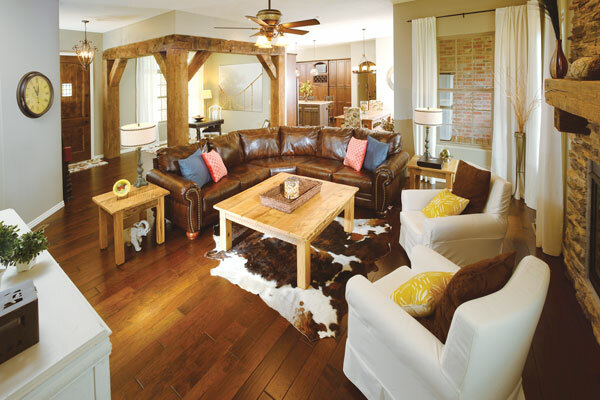 417 Home: How did you choose whereto place the rustic beams outlining the dining room and placed in the living room? Dusty Essick: The rustic timbers came from Cross Creek Architectural Artifacts; they get them from all over the nation. They’re usually from old warehouses or barns. We wanted it open between the living and dining area, so it was just a natural fit and a showcase piece. 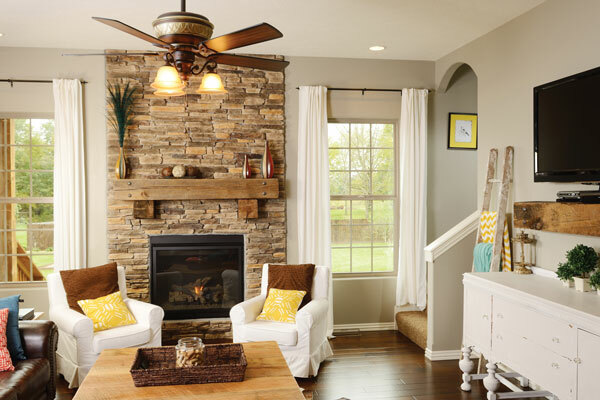 417: How did you select the stone used on the fireplace? D.E. : The homeowners knew they wanted a dry stack stone, then we picked a color that accented the wall color and the wood floors. 417: This home features both rustic and traditional styles. How did you make them work together? D.E. : The two styles come together well by incorporating the reclaimed timbers and the hand-scraped floors both in a dark color stain, then by using an antique white trim and doors. 417: What kind of cabinets are in the kitchen? D.E. : We chose knotty alder cabinets in the kitchen. Knots seem to go well with the five-inch hand-scraped hardwood floors. 417: What was the most challenging aspect of building this home? D.E. : We really didn’t have many challenges in building this home. The homeowners were well prepared and knew what they wanted. As a builder, I like to be hands-on and tend to do a lot of the projects or showcase pieces the homeowner wants myself, such as fireplace mantles, preparing and installing timbers, etc. The biggest challenge was the manual labor of lifting those large 12-by-12 timbers above our heads in the dining area. 417: How long did it take to complete this project? D.E. : We broke ground on March 1 and they were able to move in by July 31, so five months. 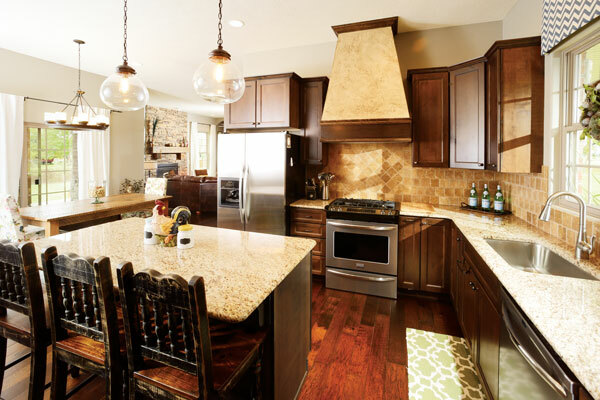 417: The island in the kitchen seems to double as usable space. Please describe this concept. D.E. : By placing the microwave in the island, it frees up a lot of countertop space as well as space for cabinets in the wall. The overhang on the island allows for barstools to make it a great family gathering space to eat and sit. Most families seem to gather in the kitchen, and an island is a very popular way to provide seating and countertop space. 417: This home has defining light fixtures. Who selected them, and what look were they going for? D.E. : The homeowner (Brooke Darnell) picked them. She wanted a clean, streamlined look, so she chose a lot of can lights throughout the house. When you do see a light fixture, it fits the Old World style. 417: Is the table in the breakfast nook handmade? D.E. : Yes, the table was custom made by Lâ€…&â€…D Custom Woodworks. The accent chairs at the table are from Kirkland’s. Midwest Rug & Linoleum Co. Thinking of building your own dream space? Our winning builders suggest adding the following rooms. Let us take you inside four of 417-land’s most impressive dwellings, designed by builders who knew just how to make us stop and stare. 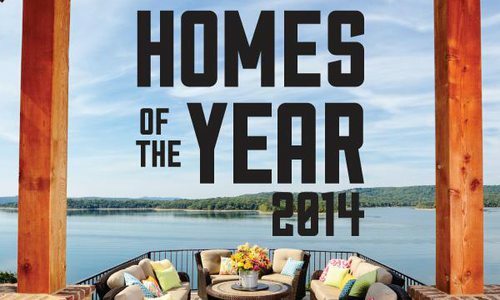 This year's homes of the year are more impressive than ever.